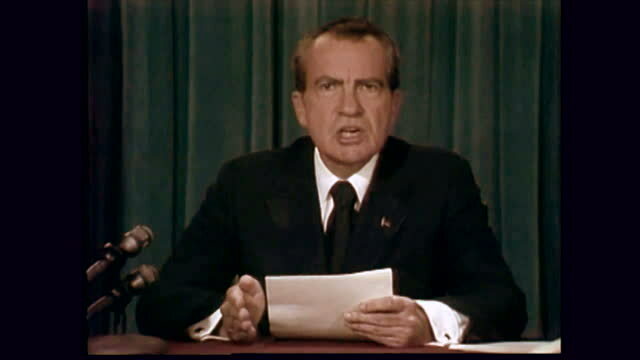 President Nixon delivers his resignation speech on August 8th, 1974. "To continue to fight through the months ahead for my personal vindication would almost totally absorb the time and attention of both the President and the Congress in a period when our entire focus should be on the great issues of peace abroad and prosperity without inflation at home," he said. On August 9th, 1974 Richard Milhous Nixon became the first and only sitting U.S. President to resign from the highest office of the land. He delivered a fifteen-minute nationally televised speech in the Oval Office the previous evening, announcing that he had relinquished his struggle to continue serving as the commander and chief, after his administration became overshadowed by the turmoil of the Watergate Scandal. Less than two years earlier, Nixon had easily won re-election, with 60% of the vote. Now he was announcing that he was resigning the presidency. Gerald Ford, his Vice President, would be sworn in as the 38th President at noon the following day, to complete the remaining 895 days of his term. Still, while his resignation seemed inevitable, Nixon refused to say he would resign in the months and days leading up to his speech. In early 1973, he ended the United States involvement in the Vietnam War and a Gallup Poll showed that he had a 68% approval rating. He continued to try to regain support by campaigning across the country and even released information about his taxes and property. He also made several television and radio appearances to try to quell any concerns, to no avail. As the Watergate findings continued to become public, his approval rating dropped below an anemic 30% for the year. Nixon, who fourteen years earlier appeared nervous and sweated profusely in his first televised presidential debate against an obscure Massachusetts senator named John Kennedy, exhibited no such defects in his resignation speech. Prior to taking the podium, he appeared calm and even joked with one of his aides with whom he facetiously suggested should deliver the speech, “blondes they say photograph better than brunettes,” he said. When Nixon was informed the cameras would soon begin rolling, he shifted into a different gear. His expression changed. The grin disappeared, his posture became straighter, his eyes darted forward and he peered directly into the CBS, NBC and ABC cameras that were broadcasting his speech to the nation. His mouth opened and his voice suddenly had more force behind it. Nixon who conceded that he did not have the necessary votes in Congress to avoid impeachment, expressed his sense of grief for not being able to finish his term, while also lending a voice of confidence to his successor. He did not show any resentment for his adversaries. He finished by saying that he would continue to work for the causes that he fought for during his quarter century in public service and invoked the Bible.